Laying the foundation for mutual growth between universities and businesses. 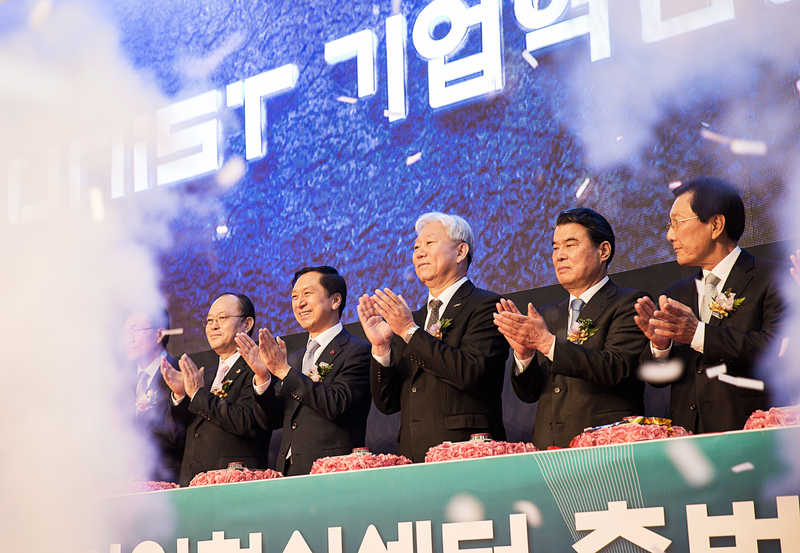 On December 5th, the UNIST Industry Innovation Center has hosted the official launch gathering at the Kyungdong Hall of Main Administration Building at UNIST. 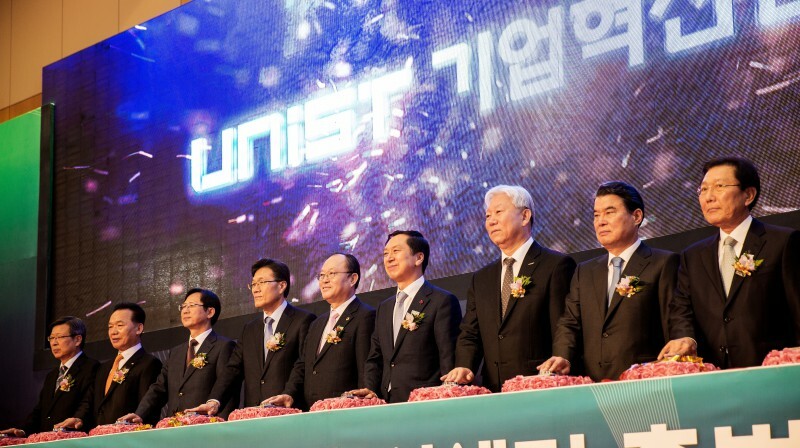 UNIST hopes the center will serve as a neutral platform for industry and academia collaboration, focusing on finding a solution to the deceleration of industrial growth in Ulsan, which can be used to further advance the key industries of Ulsan. 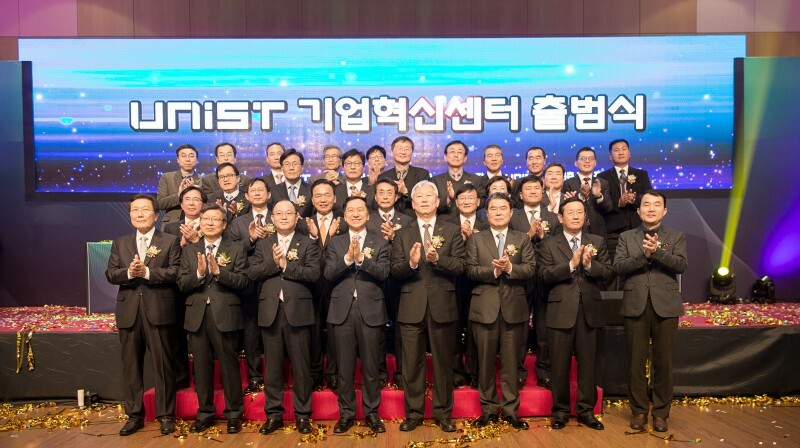 The ceremony was attended by UNIST President Mooyoung Jung, Mayor Gi-Hyeon Kim of Ulsan City, Chairperson Si-Cheol Yoon of Ulsan City, Young Do Jeon of Ulsan Chamber of Commerce & Industry, President Hwan-Doo Jung of Ulsan Economic Promotion Agency (UEPA), President Chang-Ryong Kim of Ulsan Techno Park, and key officers and industry representatives from related organizations. Attendees are posing for a group photo at the opening ceremony of the UNIST Business Innovation Center. The UNIST Industry Innovation Center provides a broad range of business support services that assist start-ups and small businesses. Its aim is to give more practical help to provide businesses with practical assistance by offering them more than just a one-time support, but instead a total periodic support. From R&D to creating an effective marketing strategy, and to attracting international clients, the center plans to help local businesses enter the global market via one-stop business support services to its members. Moreover, via one-to-one bespoke site technical guidance of professors and companies, the center also hopes to strengthen exchange and cooperation on technologies. The center will also open an exclusive window for business support to handle diverse needs of businesses promptly. It also plans to incubate promising commercializable technologies that businesses are looking for and promote both the commercialization of the technology and the vitalization of technology-based startups. The MoU signing ceremony among UNIST, the city of Ulsan, and the Ulsan Chamber of Commerce & Industry. From left are UNIST President Mooyoung Jung, Mayor Gi-Hyeon Kim of Ulsan City, and Young Do Jeon of Ulsan Chamber of Commerce & Industry. 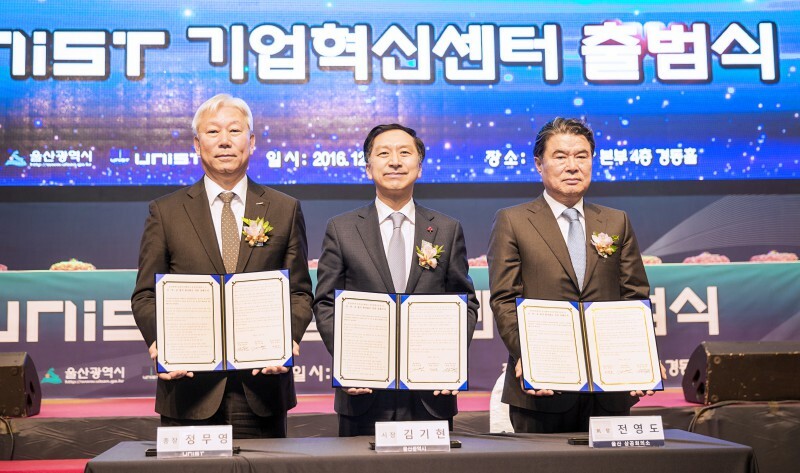 Earlier that day, UNIST also signed a Memorandum of Understanding (MOU) with the city of Ulsan and the Ulsan Chamber of Commerce & Industry to vitalize the local economy. Through this agreement, the city of Ulsan will lay the foundation for promoting Korea’s future industries via technology innovation, while the Ulsan Chamber of Commerce & Industry will examine the challenges faced by small businesses and seek for technologies in need. During the course of the event, UNIST also issued membership certificates to its fourteen new “UNIST Family Company” members. The UNIST Family Company is a management of technology consulting system that help solve technology issue that companies face today. This certificate is one way of showing the members commitment as well used to establish a lasting relationship to the company or organization.